The 13-th Workshop being the next of regularly conducted events is organized by the Institute of Applied Physics (Russian Academy of Sciences, Russia) and will be held in Nizhny Novgorod on May 17-20, 2004. Nizhny Novgorod, big industrial, scientific and cultural center (about 1.5 million population), is located about 400 km to the east from Moscow on the banks of great Russian rivers Volga and Oka. It can be reached by direct Lufthansa flight from Frankfurt (3 flights a week); other way is to use any flight to Moscow from where Nizhny Novgorod can be reached by flight or by direct train (5 hour trip by day train, 7-8 hour trip by night train in a sleeping carriage). More detailed information on transportation to Nizhny Novgorod will be provided in the Second Announcement. A book of proceedings will be published. The official conference language is English. Abstract should be written in clear English and not exceed one A4 page. It is highly recommended to use our Sample Abstract (MS Word or LaTeX version are available) as a template for the abstract preparation. Additional details on the abstract format can be found here. The abstracts have to be send by e-mail as an attached file (preferred), fax or regular mail to A. Shalashov before December 31, 2003. Filled in Pre-registration Form should be sent together with an abstract. MS Word, LaTeX, Portable Document Format (pdf) and PostScript file formats are accepted in case of e-mail submission. In order to simplify the publishing procedure Organizing Committee would recommend to send both source file (MS Word or LaTeX) and the result of its conversion into pdf format. After the abstract submission, a confirmation e-mail letter from the EC13 Local Organizing Committee will be sent to the autor. Please contact the Local Organizing Committee in case of not receiving of the confirmation letter within three days after the submission. Note that the confirmation e-mail will be sent only to the corresponding author, and not to the other co-authors.The corresponding authors will be informed of the acceptance of their presentation before January 31, 2004 (shifted to February 15, 2004) by e-mail. Invited presentations: 30 minutes including discussion. Oral presentations: 20 minutes including discussion. Posters: 1 m height x 1.5 m width (changed from 2 m width). The viewgraphs can be shown by an overhead projector or by video-projector. You may use your own laptop or a Windows-running PC provided by Organizing Committee. In the latter case, please prepare your presentation in Microsoft Power Point 2000 (or older) or in pdf format; at the meeting copy the file with your presentation to our computer and test it well in advance. The workshop proceedings will be published both as a volume (black & white, 8.5"x6") and as a CD-disk. Maximum paper size is 10 pages for invited presentations and 6 pages for oral presentations and posters. The Local Organizing Committee would highly appreciate submitting of your manuscripts in MS Word format by e-mail, although Adobe pdf format is also accepted. For LaTeX-based documents please provide us both pdf-image and the tex source with figure files. Guidelines for EC-13 proceedings format may be found here. The Registration Form has to be filled in and sent back to A. Shalashov by February 15, 2004 (shifted to February 29, 2004). The registration fee is 350 euros per participant in case of early payment via bank transfer to the bank account mentioned in the Registration Form (should be paid before March 15, 2004) and 400 euros in cash for "on-board" payment at the beginning of the meeting. The registration fee covers all the conference services, including publication of the book of abstracts and proceedings, lunches, transportation and the conference dinner. Financial support from the Local Organizing Committee will be available for a number of participants, mainly from Russia and CIS or young researches. Applications can be made directly to the Local Organizing Committee. A foreigner traveling to Russia must have a valid passport with expire date not earlier than 6 months after the date of visitor's departure from Russia and an appropriate visa. To get a visa, an official letter of invitation authorized by the Russian Ministry of Foreign Affairs has to be submitted to a Russian Embassy or Consulate either by a visitor or by an inviting institution (IAP RAS). The latter way is preferable for the Local Organizing Committee; in this case we need the information to which Russian Embassy or Consulate (Country and City) the letter of invitation should be sent. Such a letter will be timely organized for each foreign participant if he or she checks the relevant fields of the Registration Form (preliminary and/or final) and of the Invitation Letter Form, and sends these forms together with a copy of the pages of a passport where all personal data are available to the Local Organizing Committee by February 15, 2004 (shifted to February 29, 2004) at the latest. A copy of the passport pages should be sent preferably by e-mail as attached graphic file (images submitted by fax may have not enough quality, so LOC would recommend to avoid this way). To ensure that the visa is issued timely, participants are strongly advised to follow these recommendations and to apply for a visa immediately after receiving an original copy of the invitation or confirmation from LOC that letter of invitation is send to particular Russian Embassy or Consulate. 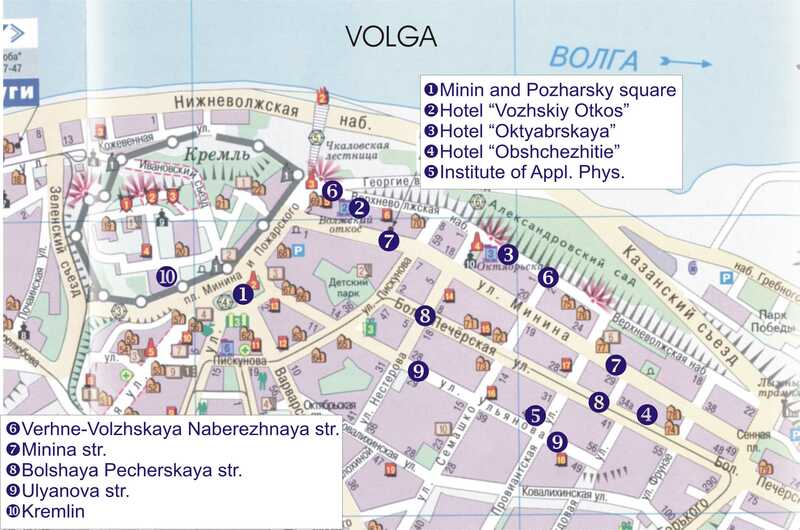 To reach all hotels from the Airport of Nizhny Novgorod we strongly recommend to use a taxi. If you arrive by train to the central railway station "Moskovskii vokzal" you may reach Minin and Pozharsky Square by express buses "marshrutnoe taxi" number 2, 33, 34, 134, 182. You can easily recognize Minin and Pozharsky Square when you see the Kremlin of Nizhny Novgorod. The map may be found with here. The schedule of the meeting is now available. To see the online version please click here. The Acrobat PDF version of the programme may be found with this link.